Washington, D.C. – A first-of-its-kind interactive map revealing the locations of more than 6,500 concentrated animal feeding operations, or CAFOs, across the state of North Carolina was released today by Waterkeeper Alliance, North Carolina Riverkeeper organizations and Environmental Working Group (EWG). In addition to swine and cattle CAFOs, the project documents the locations of over 3,900 poultry operations, which up until now have been shielded from the people of North Carolina. The maps, which EWG and Waterkeeper Alliance researchers constructed over more than three years, provide a never-before-seen aerial view of the CAFOs blanketing the state. This includes the manure lagoons from swine operations, detailing how close they are to streams, rivers and other public water sources. The maps feature satellite photos of each of the thousands of facilities. The unprecedented mapping project identifies approximate locations of all swine, poultry and cattle CAFO operations in the state, as well as the size of the operations. The online maps allow users to view total estimated waste outputs on a facility, watershed, county or statewide scale. All told, researchers from the groups estimate more than 10 billion pounds of wet animal waste and 2 million tons of dry animal waste is generated annually in North Carolina from CAFOs, leaving tens of thousands of rural residents susceptible to air and water quality contamination. Nitrates at high levels in waterways can kill off fish, and when ingested through contaminated drinking water can cause the potentially fatal “blue baby syndrome” in infants, among other illnesses in humans. Hog manure pits also contain a mix of dangerous pathogens, like Salmonella and pharmaceuticals, among many other agents that can leach into surface water sources. As the maps show, there are more than 4,100 manure pits in North Carolina, with nearly 50 percent of them located Duplin and Sampson counties alone. Additional research has shown the air pollution from CAFOs like those in North Carolina can elevate the risks for respiratory problems, eye and nose irritation, and increased mental stress for those who live and work near these animal feeding operations. The noxious fumes from CAFO operations in Halifax County have sometimes forced nearby residents, who could afford it, to stay in area motels until the plumes that hung over their homes passed. Other serious health problems associated with these animal agriculture operations include the growing threat of superbugs that are resistant to antibiotics. According to the Pew Charitable Trust’s Antibiotic Resistance Project, roughly 70 percent of all antibiotics in the U.S. are used on hogs, chickens and cattle to make them grow faster. Estimates show farm animals in North Carolina receive more antibiotics than all Americans combined. 10 billion gallons of wet animal waste are produced each year in North Carolina. 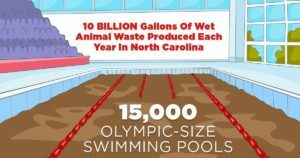 Across North Carolina, there is the equivalent of over 15,000 Olympic-sized swimming pools brimming with swine and cattle waste from CAFOs alone. Annually, poultry operations in the state produce more than 2 million tons of dry animal waste. 4,145 waste pits make up 6,848 acres of land (29,831,277 square feet). 37 waste pits are within 2,500 feet of a school. 288 waste pits are within 2,500 feet of a church. 136 waste pits are within 2,500 feet of a public water well. 170 waste pits are within the state’s 100-year floodplain. Poultry housed in CAFO facilities outnumber residents by 20 to one. The map project will be housed on Waterkeeper Alliance’s and Environmental Working Group’s websites, and will continue to be developed. Over the weeks and months ahead, locations of processing plants and feed mills will be added. The team behind this initiative will also produce similar maps for other states in the U.S. with significant CAFO operations to demonstrate the enormous impact the factory farm industry has on human health and the environment.